Lime Rock Partners is a creative private equity investment partner focused solely on the upstream oil and gas sector. 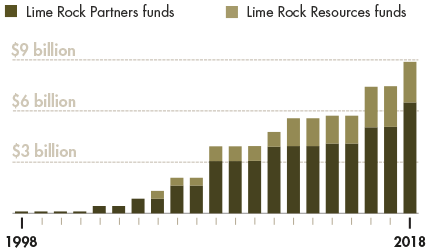 Our funds have received over $8.9 billion in total private capital commitments including over $6.5 billion made to the Lime Rock Partners strategy. Since 1998, Lime Rock has raised eight Lime Rock Partners funds, four Lime Rock Resources funds, and affiliated co-investment and acquisition fund vehicles. Since 1998, the Lime Rock Partners team has steadily made investments in the oilfield service and E&P sectors in the U.S., Canada, Europe, Middle East, and elsewhere. 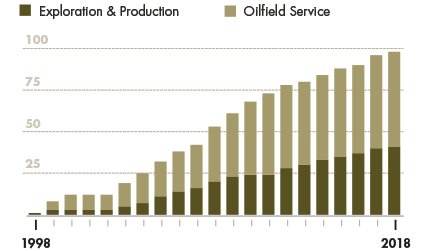 The upstream oil and gas sector has been our business our entire careers, through cycles. Since 1998, we have brought our expertise to over 90 investments. Because we seek to be selective in partnering with only a small group of new companies each year—sometimes as few as one new company—we can bring all our resources and efforts to each opportunity. Our future success depends on the quality of entrepreneurs we work with. No two great investments are the same, and we seek flexible ways to structure investments and to help our portfolio company partners excel at their growth plans, not ours. Because we don’t put companies in competition with each other, we also find ways for our portfolio company partners to benefit from all our relationships inside and outside the portfolio. In 2017, Lime Rock Partners partnered with the management team of Prime Rock Resources to pursue acquisition and development opportunities in the Delaware Basin. The Lime Rock and senior members of the Prime Rock team had previously partnered in the Endurance Resources and Endurance Texas investments. Originally formed in 2007, CrownRock has become one of the most active private drillers in the United States and a significant resource holder in the Wolfcamp and Wolfberry Plays. Building businesses is hard; building them in a cyclical sector is even harder. We never stop working to find creative ways to add value side-by-side with our portfolio company teams. Even as we work hard, we relish the fun and excitement that comes with the challenges—and opportunities—of building a business together. The global presence of our team and portfolio companies allows us to bring local expertise in our home markets and global perspective to help companies understand how developments across the world and across the upstream industry could impact them. The Lime Rock Partners team worked closely together with Shelf Drilling management in a carve-out transaction to form a leading international shallow water driller. The Lime Rock Partners team worked closely with EV, a downhole video technology leader, as it commercialized its technology worldwide. More than an observer, we leverage our search for investments in promising oilfield service technology companies to help all of our oilfield service and E&P companies establish a technical edge.